Global Surveyor - Solar System Planets And Moons Section. Mars Global Surveyor spotted a sand dune. Mars Global Surveyor spotted a gully. 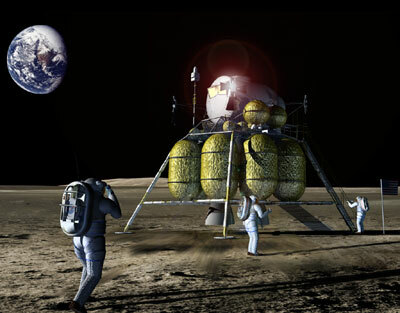 NASA Wants Rovers That Can Dig Lunar Soil. NASA has announced its fifth Centennial Challenges prize competition: the Regolith Excavation Challenge. Teams will compete head to head in 2006 or 2007 to see whose digging machine can excavate the most lunar soil, or regolith, in 30 minutes and deliver it to a collector. Any future Moon base will require large quantities of regolith to be moved around by robotic diggers, so NASA is hoping to see innovative ideas now to base future technologies around. Mars is a more dramatically changing place than scientists had ever imagined. Thanks to its long lifetime, the Mars Global Surveyor has spotted a gully coming down the side of a sand dune that didn't exist just three years ago. The gully could have formed when frozen carbon dioxide was suddenly warmed up enough that it evaporated, releasing gas that flowed downhill like a liquid. Mars Global Surveyor is still very healthy, and could be making observations 5-10 years from now. Newborn stars hide in a shroud of dust and gas, so they're difficult to photograph. Astronomers have used the Infrared UKIRT telescope on Mauna Kea, Hawaii to peer through one of these envelopes to see a pair of newborn stars - probably only 100,000 years old. The stars are quite large; however, they weigh 10 times the mass of the Sun together. The surrounding disk of material probably has enough left over to create 100 Jupiter-mass planets. Halo of Blue Light Around a Black Hole. Astronomers have known about a strange blue light coming from the heart of the Andromeda Galaxy (M31) for many years, but they were never sure exactly what it was. Thanks to new observations from Hubble, they now know it's a ring of young hot stars which are whipping around the supermassive black hole in the middle of M31. The 400 stars are packed into a disk only 1 light-year across, which is nestled inside a larger ring of older, redder stars. Our own Milky Way might have a similar phenomenon, which means this could be the situation in most galaxies.